By now, you’ve known almost everything you need to know about the new Proton X70 SUV, including the powertrain, infotainment system, safety and preliminary specifications – we’ve even provided you with a full gallery of the national carmaker’s new pride and joy. We’re now just waiting for the car to finally be launched, and Proton has given us a date – December 12, 2018. That’s three weeks from now. 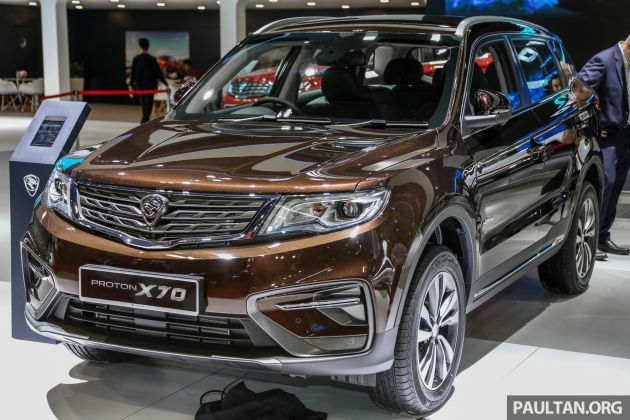 As you’d have all known by now, the X70 is based on the facelifted Geely Boyue, and will be offered in Standard 2WD, Executive 2WD, Executive AWD and Premium 2WD variants. All are powered by a 1.8 litre turbocharged and direct-injected four-cylinder petrol engine, producing 181 hp at 5,500 rpm and 285 Nm of torque from 1,700 to 4,400 rpm. It’s paired to a six-speed automatic transmission. We know that the X70 will come with the latest Geely Smart Ecosystem (GKUI) infotainment system with an eight-inch touchscreen and voice control with artificial intelligence. We also know that the Premium model will get an Advanced Driver Assistance System (ADAS), consisting of autonomous emergency braking, lane departure warning, adaptive cruise control, blind spot monitoring and auto high beam. All that’s left is the price, which will be revealed at the launch – so stay tuned. The moment the rakyat have been waiting for. All waiting with bated breath! Proton X70 enjoy skim Afta. SEA neighbors, Singapore indon thai india australia brunai. All waiting with bated breath! Gudluck P1 !! The moment only john has been waiting for. John waiting with bated breath! Habis X70 only sold 1 unit. 12,000 units have been booked. Abesla basher! No price how to book? Abesla Proton giving X70 away for free. later price out basic unit Rm 90k++, i think have 50% cancellation order lor.. unless proton fake the sold number. Yup. Toyota salespeople now crying and scrambling their supporters to talk bad about X70. But I wonder if womenfolk would accept them talking bad and talking nonsense about their competitor lingerie? They most certainly will be chased out of the dept stores!! I hope this is not how they are going to manage your warranty claims. What?U have been waiting ?Make no mistake any more.Those who get the loan approved n start driving by Christmas…gonna cry…everytime visiting petrol pump to pump….this vehicle drinks petrol like rocket fuel…When price of petrol reached RM 3.50 litre,with no subsidy…a tankful gonna set u back Rm170….Bolehland…people buy cars without knowing the actual price n test driving. BTW can add pics of the glove box? Does it look proper or got a fusebox eating into the space? Made the RM99 booking, here wondering too. Cant wait to get the free ice cooler box worth RM200 lols. Thanks Jonathan bro. Looks like P1 engineers did a thorough proper whizz bang job in the RHD conversion. Not like those lazy Frenchies conversions. Kudos to P1! Looks outdated already. Looks like the first version of the Suzuki Vitara but bigger. Better buy reputable brands than this. Also until today, no price!! Doesn’t matter if it looks outdated. More important are the features it gives you in proportion to price. Better get ur eyes checked bro. No need to release it la. If release only can sold 1 unit for sure. Wow, the troll is working overtime to spew BS. He got no sales, so he needs to find side income lor. Toyota launching new Rush, with new Camry and Vios upcoming still empty showroom ah? You are the proof Toyota’s time has passed, troll. If it is expensive, which is above of what we expect it to be, I think it’ll kill malaysian interest in this car…maybe this is the reason proton kept it secret till now…or, orrr proton wanted to give a nice surprise to us where they manage to slap in a price that is below 100k, 80k – 90k maybe?.. I’m more towards it being an expensive one, haha..better negative thinking now rather than hoping for something good but turns out to be a heartbreaker..
Actually what’s flat is your brain … go have it check please. To the basher dupe: HAHAHAHAHAHAHAHA! After 2x of Toyotaish price revealed, 99% booking cancellation. Only 1% booked by john. After seeing all the comments about the X70, the car itself is great but over hyped by the brand and the fans themselves. A gud car deserves to be hyped. A lousy car that plays hide and seek, teasing here and there and everywhere deserves nothing. A gud car deserves to be hyped. A lousy car (X70) that plays hide and seek, teasing here and there and everywhere deserves nothing. Deswai a lousy car (P2 SUV) only knows how to play hide and seek, teasing here and there. China car + proton brand..can’t imagine how bad will be the RV?buy at 90k after 1 year become RM50k?fuh..better buy sushi car..they keep delaying the launching date because government did not approve yet the OTR.what to launch some more?everything reveal olredi?pity u rebadge company.over 30 years develop engineers finally REBADGE. (sigh) develop engineers should be from REBADGE until can develop own product.but what happen to proton,reverse engineering??? What a nonsense comment haha. You need to learn more and read about automotive industry worldwide. Do you know that Mercedes Benz just rebadged the Nissan pickup truck and made theirs? PDRM will buy it 5000 units to replace their old xtrail.. If the price is above Rm100k, then I will cancel the booking snd ask for refund. There are other reputable suv like subaru, mazda CX5 new engine turbo etc.in 2019. Dude, you think the CX-5 turbo would be 100k? More like 160k to replace the current 2.5L model. Better replace the diesel. I am now worried about the B10, as thinking of taking the 2.2GLS next year. If the price is above Rm100k, then I will cancel the booking snd ask for refund. There are other reputable suv like subaru, mazda CX5 new engine turbo etc.in 2019. Many new models of other makes. Dude, that’s a Mazda. Not some china brand with proton badge. Seriously paultan.org, can you guys please update your gallery system after so many years, it is the WORST and HARDEST to use gallery system on any website I have encountered, very very user unfriendly and does not do justice to all the hard work you guys put in to put together all the photos. I have endured this for far too many years of reading your website. Saw the new X70 and the car was great except it is not friendly to tall guy to drive it. The steering position was TOO LOW even though I set it to highest and the seat I set to lowest. The center console panel was too wide affect my left leg position and my left thigh is only about 1 inch lower from the steering wheel. Mean while turning the steering wheel my left hand will likely hit my left thigh. Yes I can put the seat backward so my legs will get more room but the legroom st back seat become smaller. It will then only able to set a person who height maybe 170cm or shorter. With my height of 183cm I got no problem to drive Wira comfortably but not this X70. Hope in future Geely will consider to design their car to suit not only to moderate height but also to tall person. when will x70 launch in India….? ?